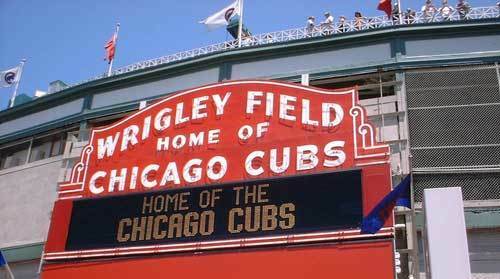 If you are visiting the Windy City this summer, you are going to have to check out a Chicago Cubs Game! We've got the goods on the historic stadium Wrigley Field! Wrigley Park was built on Chicago's North Side in 1914. It was originally named Weeghman Park and was intended for the Chicago Federals of the brand-new Federal League. After the league folded in 1916, the owner purchased the Cubs, who were playing in a field on the West Side of Chicago called the West Side Grounds. In 1926, the ballpark was re-named to Wrigley Field after their owner and chewing-gum mogul, William Wrigley, Jr. Wrigley Field was also the home of the [KWLINK9178]NFL's[/KWLINK] Chicago Bears from 1921-1970. 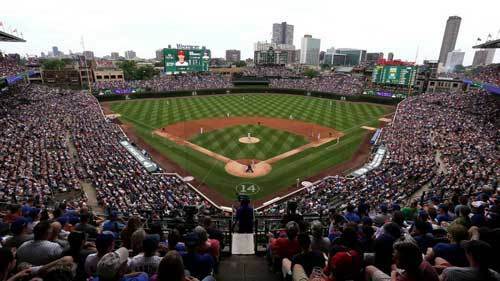 Wrigley Field is the second-oldest ballpark in the Major Leagues behind Boston's Fenway Park. While many teams have these high-tech new stadiums, Wrigley Field has an aura and mystic about it that no stadium can match. The trademark ivy leaves on the outfield walls or the traditional Wrigley Field sign that hangs in the front of the stadium. Wrigley is also one of the last stadiums to have a manual scoreboard. There is a lot of tradition and pride with Cubs fans too. Legendary Cubs announcer Harey Caray started the tradition of singing "Take me out to the Ball Game," during the seventh inning stretch. And fans still throw back any home run the opposing team hits, back onto the field. The atmosphere at Wrigley is an experience like no other. They consistently rank in the top five in attendance and sell outs. Babe Ruth hit his famous "called shot" home run in the 1932 World Series. It was also at Wrigley where Ernie Banks hit his 500th home run in 1970 and Pete Rose got his 4,191st hit to tie legend Ty Cobb. In the late '90s, Sammy Sosa hit home runs number 61 and 62 to tie the all-time, single-season home run record. Wrigley has also played host to several All Star Games. Surprisingly, the Chicago Cubs have never won a World Series since playing at Wrigley. In fact, it has been exactly 100 years since they have won it all. Many blame the Curse of the Billy Goat for this drought. The talk of a curse heightened in 2003, when the Cubs reached the NL Finals and were leading the Marlins 3-0, until Cubs fan, Steve Bartman, unintentionally interfered with a crucial defensive play by the Cubs. That play could have stopped the Marlins, who ended up winning that game and eventually winning the series. Wrigley Field is nicknamed The Friendly Confines. Wrigley Field seats 41,118 fans. Wrigley Field's original capacity was 14,000. Wrigley Field originally cost $250,000 to build. Wrigley Field has appeared in several movies including The Break Up, Ferris Bueller's Day Off and Rookie of the Year. Wrigley Field did not have night lights installed until the 1988 season. Wrigley Field is one of the few sports stadiums to have minimal advertising.